And that's five in all caps because this book is AWESOME!!! It's the best book I've read this year and last. It was one hell of a page turner and I HATED when I had to put it down. I was pretty sure it'd be good when I read it, but it surpassed any feelings I could've come up with. I bow, humbly, to Karen Hooper for this book. She did an excellent job. Yara is a seventeen, almost eighteen, year old girl who lives semi on her own and semi with her Uncle. In the midst of a Hurricane she's rescued and then thrown into a world she never imagined was real. Here's the deal, and you all know what's up, it's time for SPOILERS. This is another one of those books that I SOOOOO don't want to spoil for anyone who hasn't read it. I should just leave it here and be done. However, I know some people like spoilers so if you MUST, then go ahead and click read more...but you really shouldn't. UGHHHHH! You clicked it? For real? Well, you'll be disappointed because I refuse to spoil this awesomely fantastically fabulous book for you, yep that's right, I won't do it. 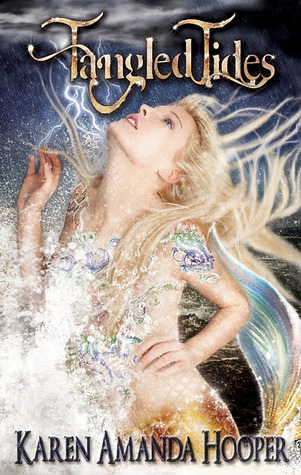 I'll tell you it's a story with a take on mermaids, selkies, sirens, and gorgons. It's not like your typical fantasy, and it's just freaking awesome. And that's all I will say. Quite honestly, I feel like that's too much. It's that good. So go grab your copy and read it! And if you haven't checked out my giveaway, go enter for a chance to win a copy of Karen A Hooper's newest book (coming out May 25), Grasping At Eternity. There's another book and some critiques up for grabs too. So go check it out. this book is everywhere. Everyone givees it five stars. It must be a masterpiece. OMG, you are the sweetest. The spoiler thing cracked me up. I'm so glad you loved it. And best book of this year and last is an unbelievable compliment. Thanks so so much. And that's one awesome review. I'll be checking it out. Karen- You're very welcome. I meant every word and I just couldn't spoil it...I really don't like to spoil a good book.